Get married in a setting that’s as beautiful as your love affair with this Valley of Fire Wedding by Private Limousine. Enjoy the luxury of limo service, the services of a professional photographer and the convenience of someone else planning all the details with this worry-free tour. All services and license fees are included to ensure that your red rocks marriage is exactly as you’d imagine. Important Note: Each booking must have 2 people only. Please note: The listed price does not include fees for the Marriage License, $77 (subject to change) and Driver Gratuity, $75.00. 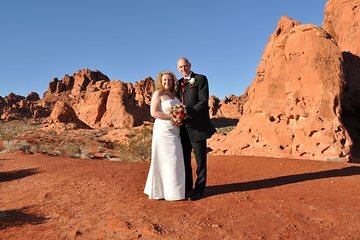 Your big day Valley of Fire Wedding by Private Limousine kicks off with private pickup from your Las Vegas hotel and a quick stop at the local courthouse. Collect your marriage license and proceed to the Valley of Fire on a scenic 45-minute drive. These stunning red rocks will serve as the impressive backdrop to your romantic ceremony, which will be captured by a professional photographer who will snap 100 pictures at various scenic locations. With plenty of ways to personalize your big day, this tour ensures all your Las Vegas wedding dreams are a reality! Extra two hours, one for the park and one for the strip. Great time!!! Limo driver was very friendly and attentive. Photographer was awesome. Minister was nice and friendly. It was just my husband and I. but Viator had the entire production down from beginning to end. Wonderful Experience. I wouldn't change a thing! Recommend for sure !!! Everything was perfect !!! The chapel respected the couple of requests we had and provide us an outstanding service.We warmly recommend the Valley of Fire Wedding by private Limousine. This was absolutely perfect from start to finish! I can't think of one bad thing to say. Highly recommend. Very well organized! Me encantó todo! El fotógrafo todo un profesional y el chofer encantador! Fue una experiencia inolvidable. Gracias! The trip was everything I'd hoped for! The limo was on time, the driver was great (Chad) and went above and beyond accomodating my need for Static Guard (due to the low humitity my dress needed help) by stopping at Walmart on the way to the park. It was a very beautiful setting and the day was just perfect. The photographer told us it would take up to 2 weeks to get our disk and it took 3 days! The taste of the little cake was amazing and we all wanted more! The only thing they needed was a bottle opener for the limo, but we managed. :) I couldn't ask for a more smooth running trip by A Special Memory Chapel who was behind this package. I would easily do it over in a heart-beat. The only thing I didn't get was the certificate holder for our marriage license but I really could care less about that. Definitely consider doing this if you want everything taken care of and to be stress free on your big day! Thanks again for making our special day even more enjoyable by having your act together. Valley of Fire was breath-taking and I would have liked to sight see longer... maybe someday I'll return to do that. one of the best memories of our lives !!!!! Everything Was wonderful. The limo was on time, the ceremony was beautiful, the cake was delicious, and we would have rated it 5 if the photographer would have given us the pictures when promised. It has been over a week and still he has never contacted us personally or sent us our photos. But otherwise we loved everything.